Research suggests that 50-80% of Americans report some form of dental anxiety. In addition, about 25% of Americans are actually scared of dentists. Although there are many causes of dental phobias, many adults report that a bad experience as a child was the source of their fear. One important thing that parents and caregivers can do for their children is to teach them healthy dental habits early. This includes, not only dietary habits and brushing and flossing, but visits to the dentist. Here are some tips to help prevent children from developing a dental phobia. Your child’s first dental visit should occur within 6 months of the eruption of their first tooth, and no later than one year of age. This isn’t just our recommendation, but it is the recommendation of the American Academy of Pediatric Dentistry, the American Dental Association, and the American Academy of Pediatrics. It’s important to introduce your child to the dentist before a problem occurs, so the child doesn’t associate pain or trauma with the dentist. It is those bad first experiences that make patients scared of dentists. This is why the old recommendation of seeing your dentist by the age of three has been replaced. At your child’s first appointment, your dentist can answer any questions you may have, highlight proper cleaning techniques, and recommend oral care products. Your child’s earliest dental visits help set the stage for good oral health. Children like to mirror the habits of their parents and siblings. Ensure oral hygiene is part of the household routine, especially at night before bed time. Brush teeth as a family, and show kids how much you enjoy it. Help your children brush and “check up” after they brush their teeth so that you can not only help them but reward their behavior. Create excitement by letting your child choose a favorite toothbrush. When kids think oral hygiene is enjoyable and not a chore, they’ll look forward to brushing their teeth. There are apps and timers that help encourage good oral hygiene such as the Oral B Magic Timer App on the Google Play Store. Kids are intuitive and can pick up energy from parents. Sometimes a parent might have a dental phobia or apprehension about the dentist. It’s important not to share these with children. Stay upbeat and positive when describing teeth cleaning and dental visits. For young children, we also recommend using simple, kid-friendly language like “cavity bugs” to explain the importance of teeth cleaning in a fun, approachable way. For children who are nervous about visiting the dentist, dental professionals can help rebuild trust. Ahead of the dental visit, share concerns with dental staff. Many practices offer “acclimation” appointments, which give children the opportunity to see the office in a stress-free environment. Kids can see the dentist chair while staff demonstrate a dental cleaning on a stuffed animal. During the acclimation appointment, kids get a chance to practice and play. They learn there’s nothing scary about visiting the dentist. Most dental offices have images on their websites and Facebook pages. Share these pictures with children. This can be especially helpful for children with special needs. The tour gives them a chance to familiarize themselves with the space ahead of the visit. For example, our office offers a virtual tour, so children can explore the office from a computer or smartphone. Sometimes when a child has a lot of dental work or needs, your dental professional may recommend anesthesia. Discuss options with your dentist to find the best solution for your child. After dental issues are resolved, this can be an opportunity to start from a “clean slate” and build good habits and visits moving forward. 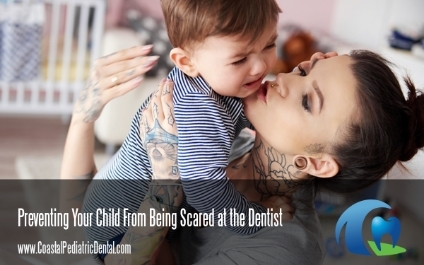 This is especially true for children that scared of dentists or have been traumatized by previous dental work. For more information or tips, or to discuss anesthesia for your child’s dental care, please don’t hesitate to call Coastal Pediatric Dental & Anesthesia. Drs. Cwiak and Wong will be happy to help you and your family.